We're still cheering on First Lady Michelle Obama's jaw-dropping fashion moment at her last official State Dinner as she rocked a gorgeous rose gold-hued chainmail Versace gown to welcome Italian Prime Minister Matteo Renzi and his wife, Agnese Landini, to the White House. 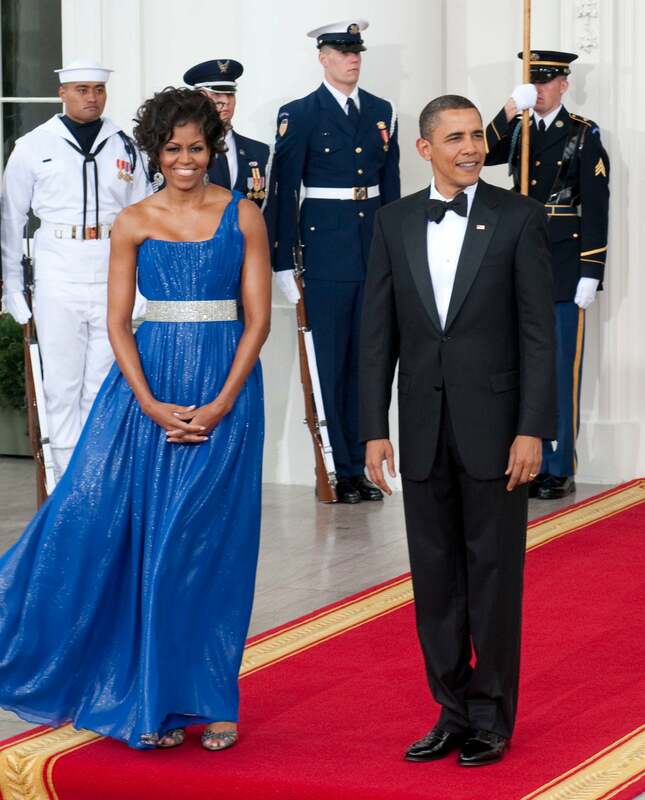 FLOTUS is no stranger to iconic style moments, take a journey with us as we review her looks from State Dinners past. 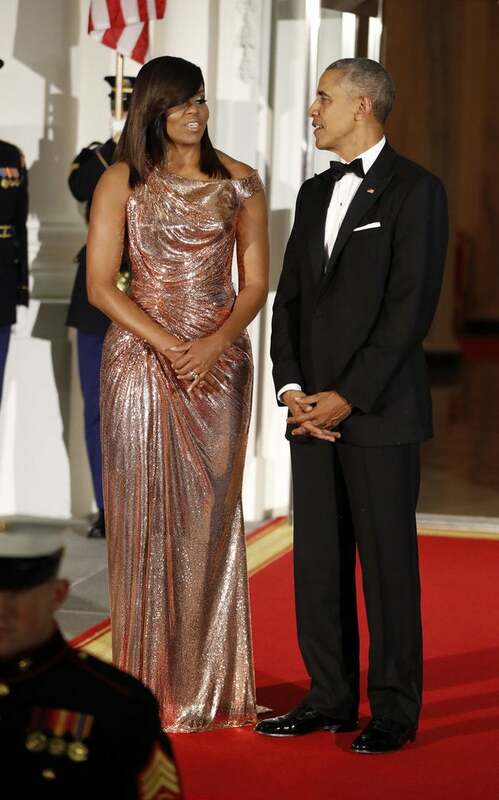 As First lady Michelle Obama and President Barack Obama made their state dinner debut in 2009, Mrs. Obama gave us a preview of many stylish dinnners to come in a Naeem Khan strapless metallic gown. First Lady Michelle Obama helped welcome Mexican President Felipe Calderon and Mrs. Margarita Zavala to the evening's State Dinner in an electric blue one-shoulder Peter Soronen gown. Her bold rhinestone belt added a fun and cinched touch to the dress. 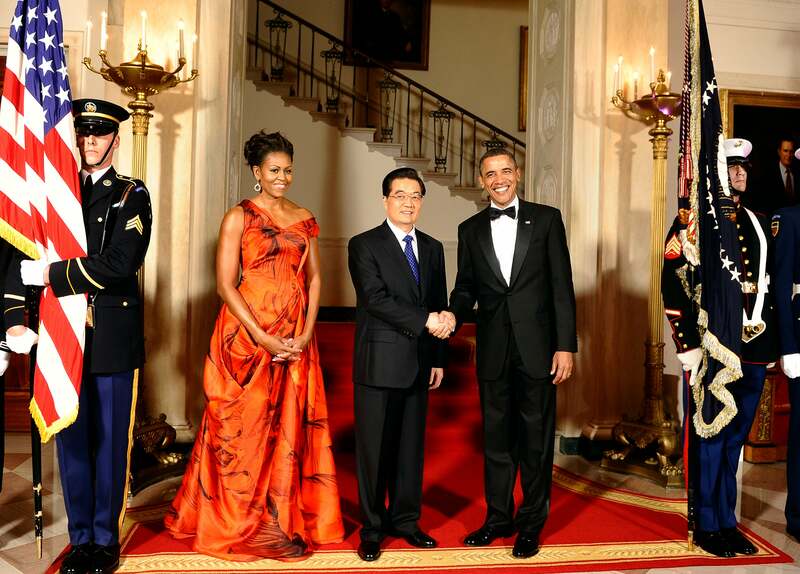 FLOTUS stood out in a Sarah Burton for Alexander Wang gown as President Barack Obama welcomed Chinese President Hu Jintao to the White House back in January of 2011. The firey hue, extravagant draping and floral pattern made for a bold and beautiul choice. 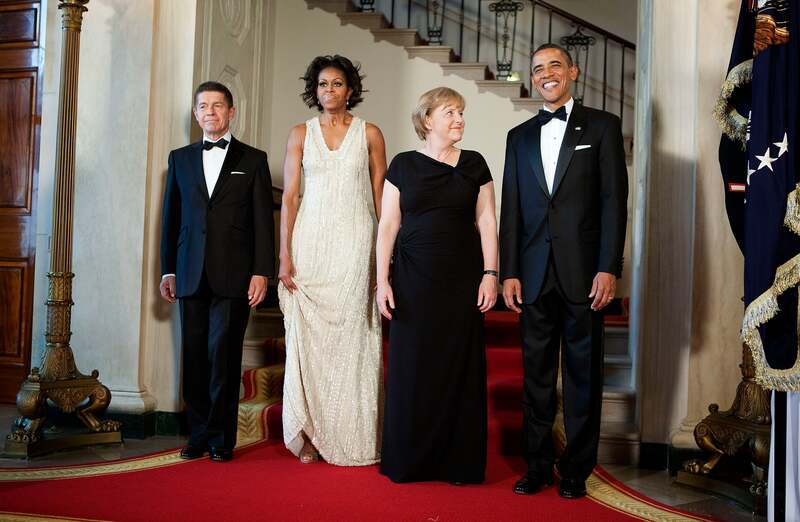 First Lady Michelle Obama posed alongside President Barack Obama, Angela Merkel, chancellor of Germany, and Joachim Sauer, Merkel's husband in a silver beaded Naeem Khan dress paired with fun arm embellishments. 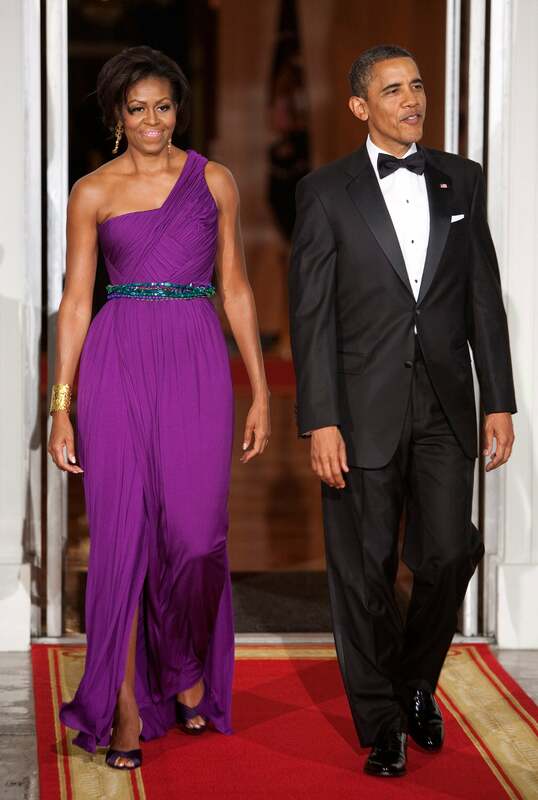 For South Korea's state dinner FLOTUS donned a deep purple gown by Korean-American designer Doo-Ri Chung. Her crystal belt and gold accessories pulled the stunning look together. 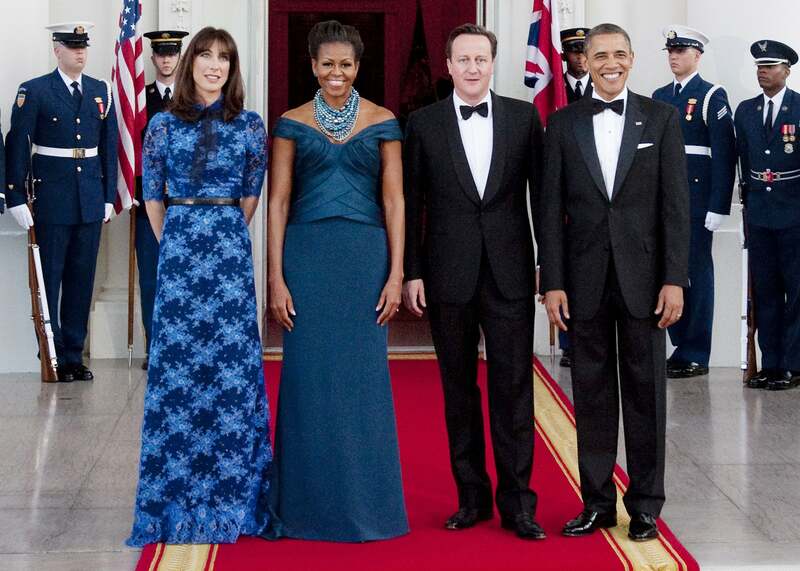 A jewel-toned Marchesa gown was the First Lady's outfit of choice to welcome British Prime Minister David Cameron and his wife, Samantha Cameron for the State dinner in March of 2012. She paired the gown with a gorgeous cluster of blue, grey and silver pearls by Tom Binns. 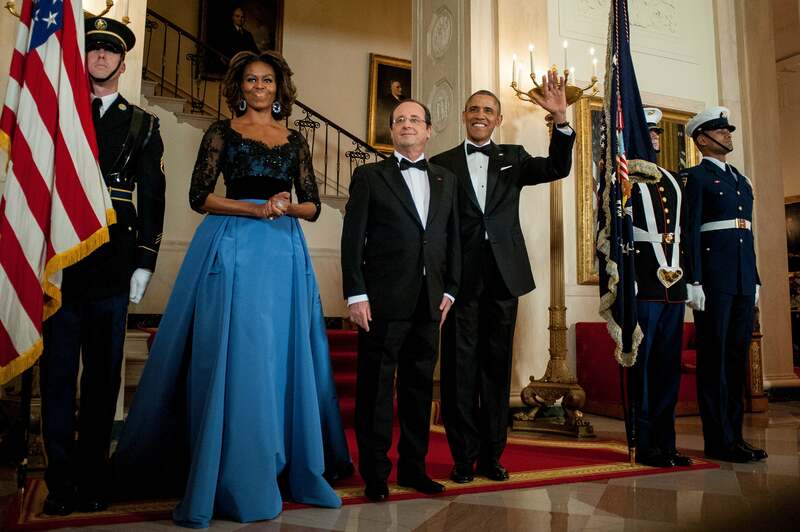 Carolina Herrera was the designer of choice for Michelle Obama as she and President Obama posed with French President, Francois Hollande. The black and blue gown with lace detail made for a classic and regal look. 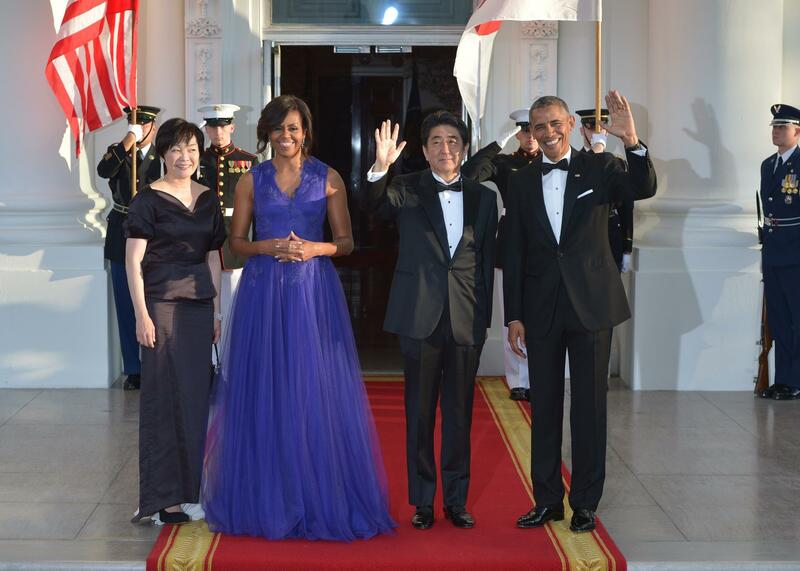 First Lady Michelle Obama helped greet Japan's Prime Minister Shinzo Abe and his wife Akie Abe in a deep purple flowing Tadashi Shoji gown. The dress is a customized version from the designer’s fall 2015 show. FLOTUS brought State Dinner fashion to a head in this show stopping silk mermaid Vera Wang gown with off-the-shoulder tulle sleeves. As she and President Barack Obama awaited the arrival of Chinese President Xi Jinping and his wife Madame Peng Liyuan, her dress did all the talking. 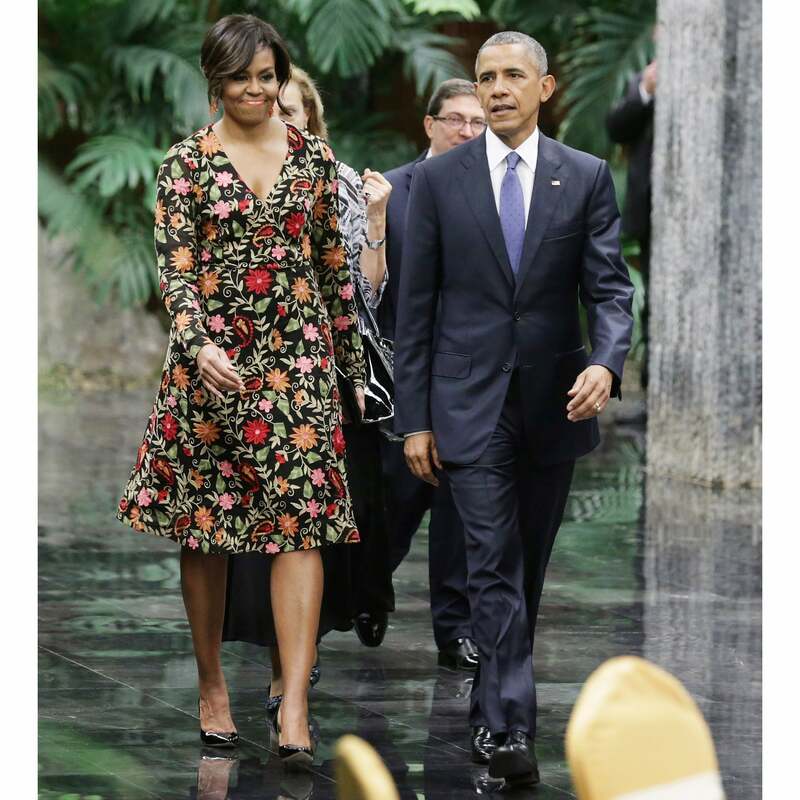 Michelle Obama wears a gorgeous floral day dress to a state dinner at at the Palace of the Revolution in Havana, Cuba. 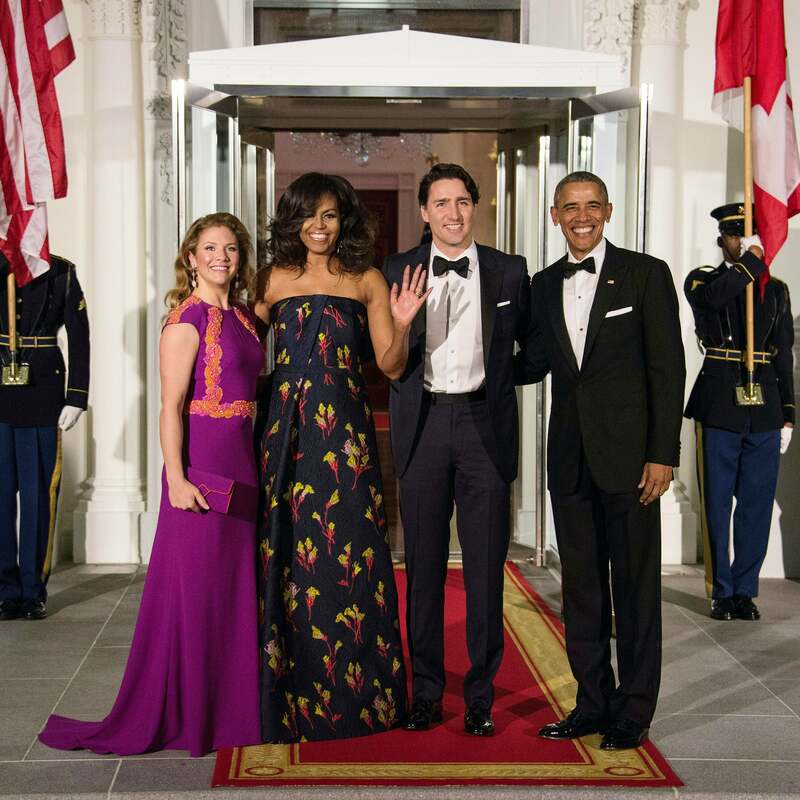 Michelle Obama makes a statement in a Jason Wu gown as she and President Obama welcome the Canadian Prime Minister Justin Trudeau and his wife Sophie. 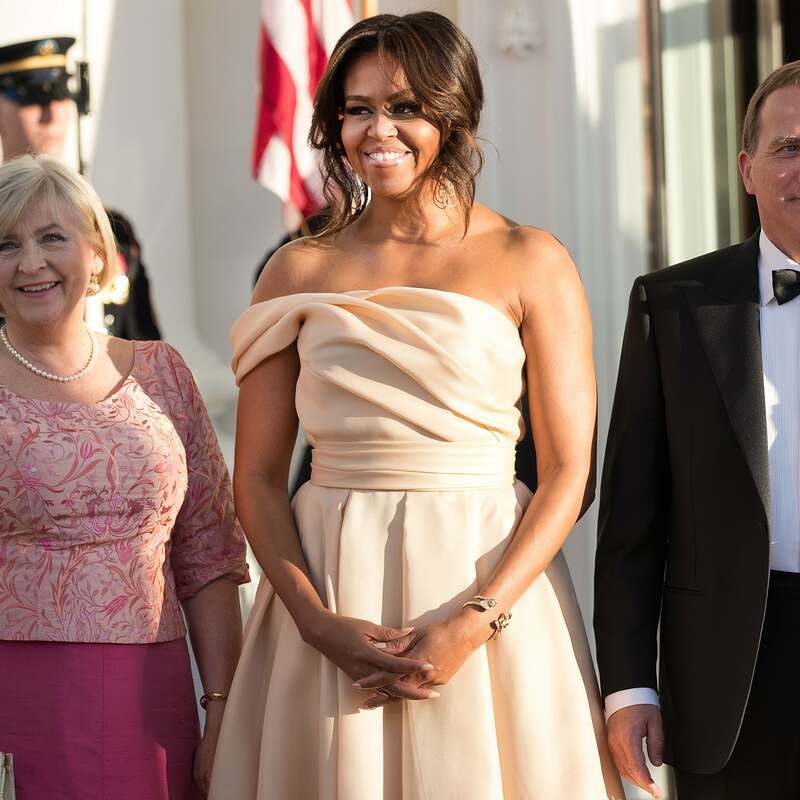 The First Lady welcomes Nordic leaders to a State Dinner in a flowing off the shoulder gown. 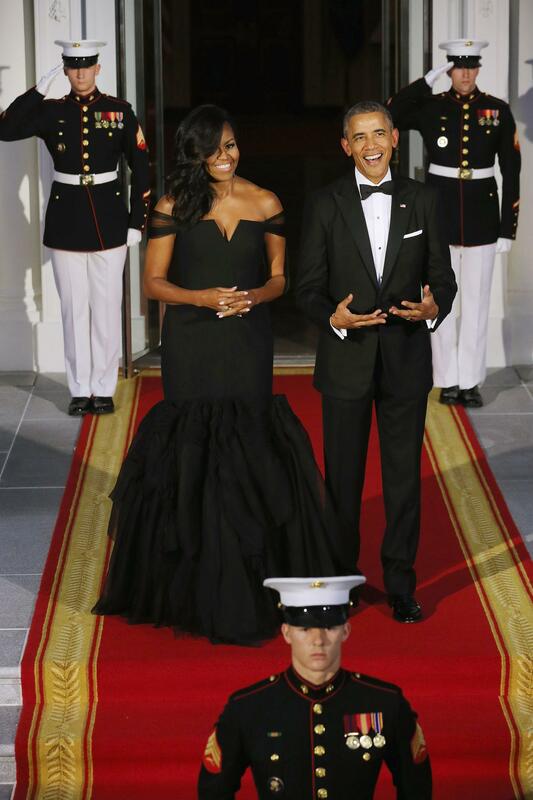 Michelle Obama was a sight to be seen at the Obama's final official state dinner. And this rose gold chainmetal gown by Atelier Versace is sure to be one we won't forget. Slay First Lady.